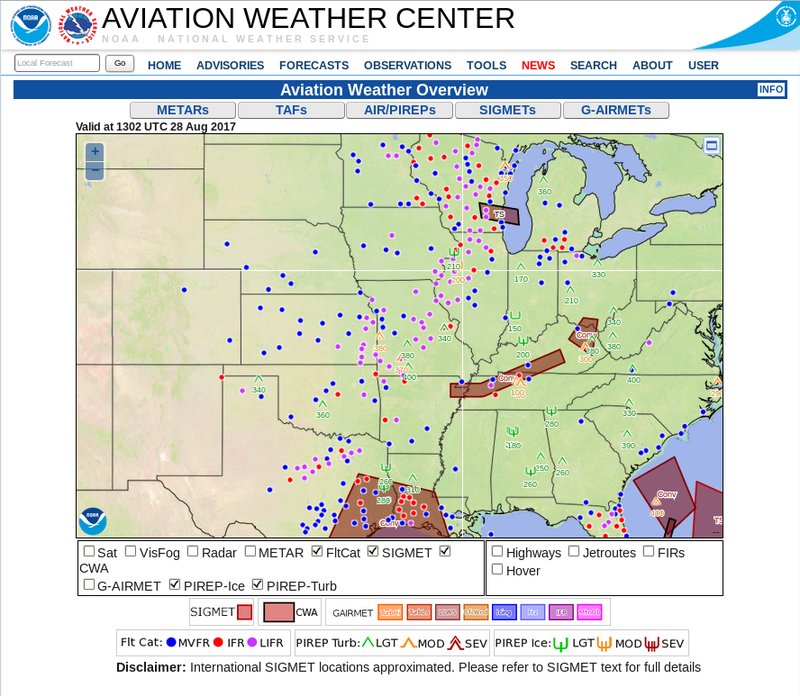 IFR Conditions and Dense Fog developed over southeastern Missouri during the early morning on 15 August 2017, leading to the issuance of Dense Fog Advisories. 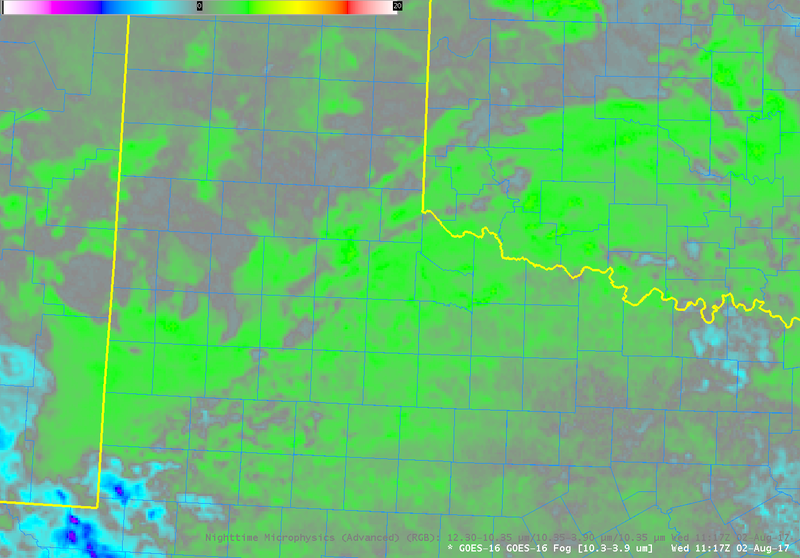 GOES-R IFR Probabilities, above, showed increasing values as the ceilings lowered and visibilities dropped. The IFR Probability fields over southern Missouri and northern Arkansas (and Kansas and Oklahoma) have the characteristic uniformity that arises when Rapid Refresh data alone are used to drive the IFR Probability values. 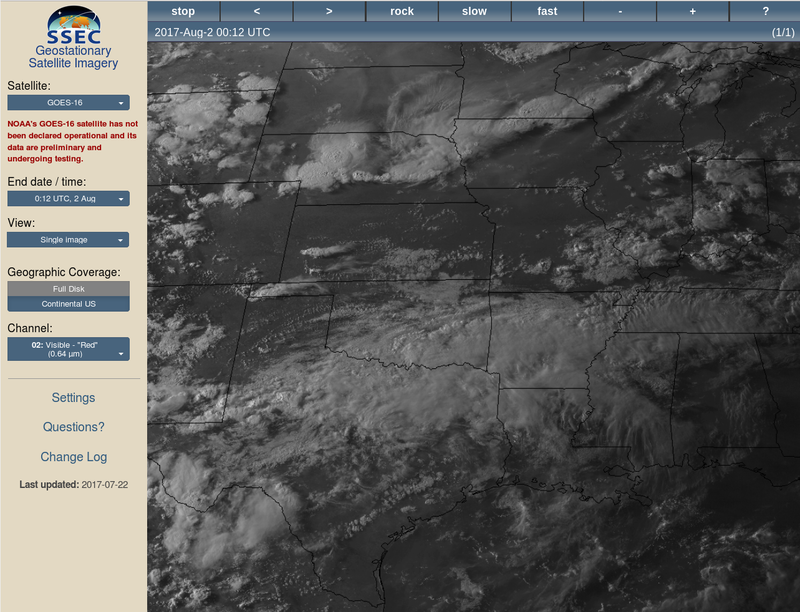 In these regions, high clouds (associated with convection over Arkansas) are blocking the satellite view of lower clouds. Such high clouds will make it difficult for a satellite-only product to identify the regions of clouds. 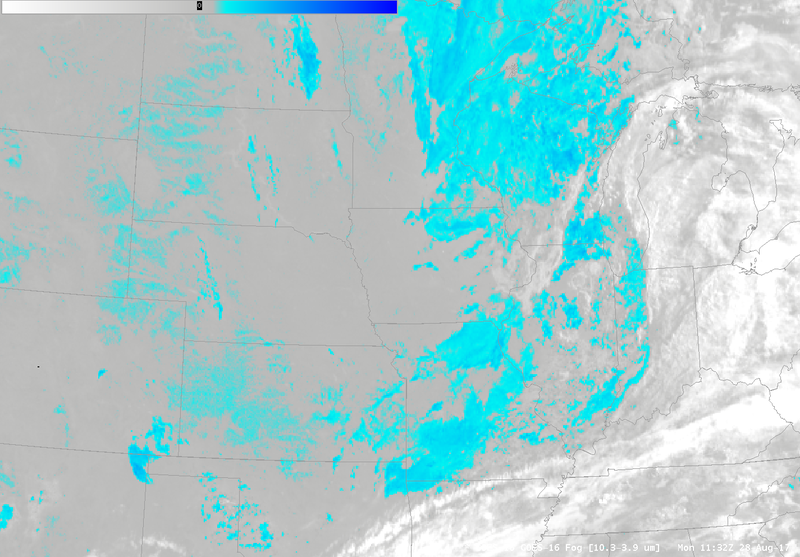 For example, the Brightness Temperature Difference field below (10.3 µm – 3.9 µm) from GOES-16, color-enhanced so that low clouds are green and that cirrus (at night) are purple) shows widespread low cloudiness at the start of the animation, including some obvious river fog over Missouri (river valleys that are not well-resolved with GOES-13), but developing convection over Arkansas eventually prevents the view of low clouds. Because the Brightness Temperature Difference field (helpfully called the ‘Fog’ Channel Difference in AWIPS) is challenged by high clouds in viewing the low clouds, RGB Products that use the brightness temperature difference field are also similarly impeded by high clouds. Consider, for example, the stations in southern Missouri shrouded by the cirrus shield. IFR Conditions are occurring there and a strong signal of that appears in the IFR Probability fields. This entry was posted in GOES-16, Midwest, Multiple Cloud Layers on August 15, 2017 by Scott Lindstrom. 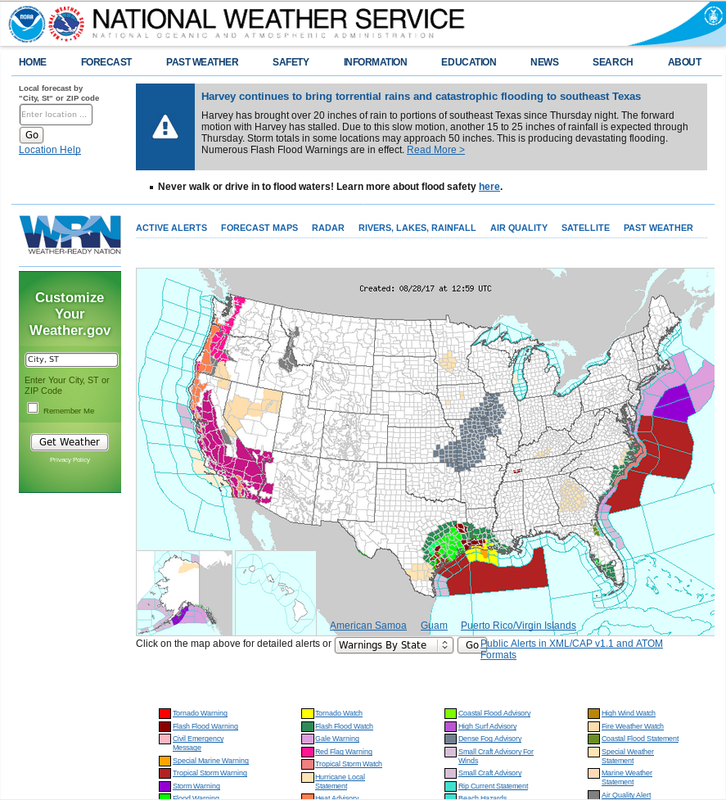 The National Weather Service in Lubbock issued Dense Fog Advisories (below) for parts of their CWA early in the morning on 2 August 2017. 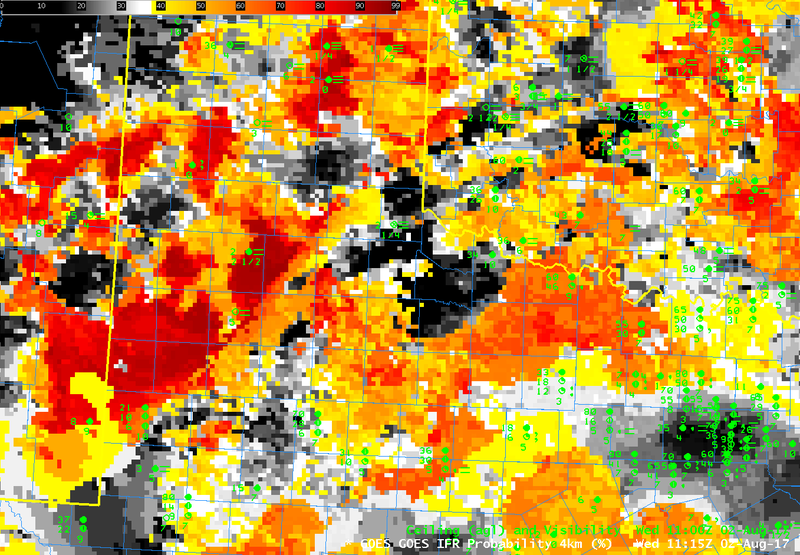 GOES-R IFR Probability fields, above, show a slow increase in values over west Texas during the night of 1-2 August 2017, as visibilities drop and ceilings lower in the region. This followed a band of showers that moved through the area around sunset on 1 August (Click here for a visible image from 0017 UTC on 2 August, from this site). 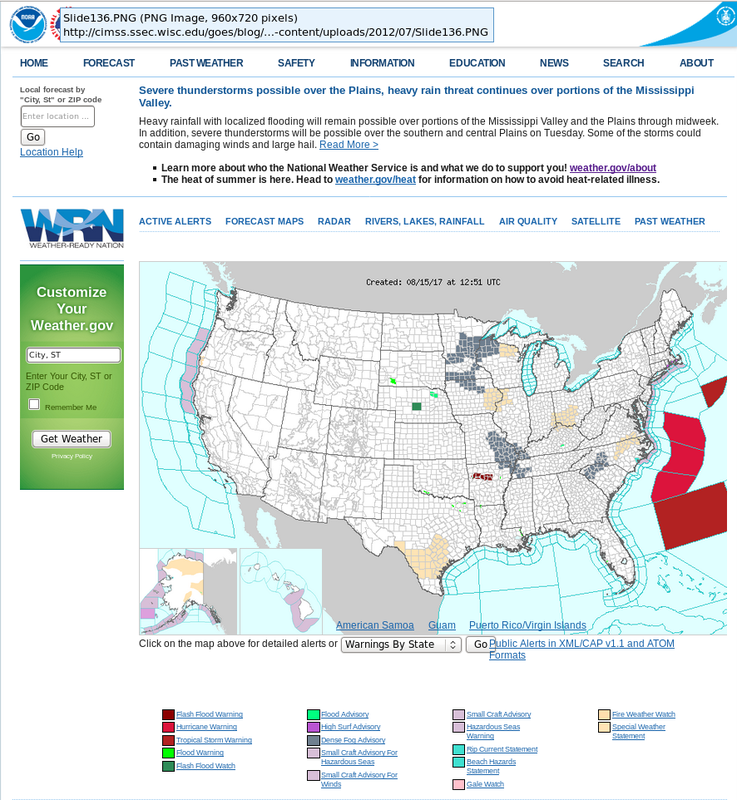 Highest IFR Probability values at the end of the animation generally overlay the Dense Fog Advisory. As a situational awareness tool for the developing fog/low stratus, IFR Probability performed well. The GOES-R IFR Probability fields above mostly show the small-scale variability (i.e., pixelation) that is common when both (legacy) GOES data and Rapid Refresh Data are used to produce a probability that IFR conditions will be present. 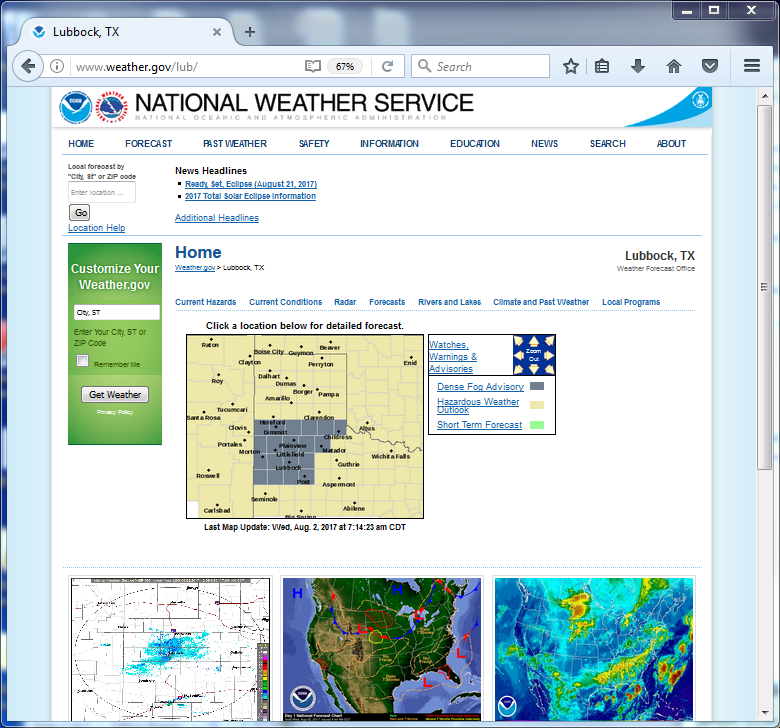 Some exceptions: southeastern New Mexico at the end of animation (1115 UTC); the yellow and orange region there overlain by mid-level or high clouds that prevent a satellite view of the low clouds. The GOES-16 Brightness Temperature Difference (10.3 µm – 3.9 µm) field at 1117 UTC shows a signal of high clouds there (cyan / blue / purple enhancement showing negative values that typify thin cirrus in the Brightness Temperature Difference field at night). The Green values in the color enhancement are positive values and correspond to stratus (composed of water droplets) clouds. Because the Brightness Temperature Difference field shows a signal, the Advanced Nighttime Microphysics RGB will also have a signal for fog (the whitish/cyan color), as shown below. GOES-16’s better temporal and spatial resolution allow for more accurate monitoring of the development of small-scale features. However, the shortcomings of using a Brightness Temperature Difference from satellite to monitor fog development should not be forgotten: In regions of cirrus, satellite views of low stratus and fog are blocked. In addition, over Texas and the rest of the High Plains, upslope flow can generate stratus over the central Plains that becomes fog over the High Plains as the terrain rises into the clouds. 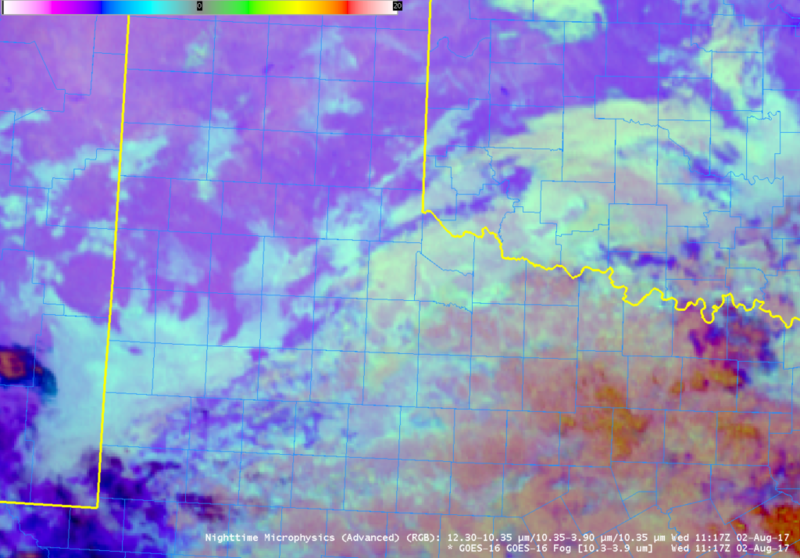 The top of the stratus cloud and the fog bank in such a case can look very similar from satellite. Below is a toggle between the 1115 UTC IFR Probability field, the GOES16 Brightness Temperature Difference Field, and the GOES16 Advanced Microphysics RGB Composite. This entry was posted in GOES-16, Plains, Texas on August 2, 2017 by Scott Lindstrom.